Celebrate World Labyrinth Day with us! You, your neighbors, friends, and family are invited to join people worldwide in walking your local labyrinth at exactly 1pm in support of world peace. It takes about 30-40 minutes to walk to the center and back as the Puna Women’s Chorus serenades you –for the third year in a row– with songs of peace from around the globe. The grassy paths are lined with lush plants and flowers…and a few surprises! There is a place to get out of the rain if need be. Walking the labyrinth is a symbolic representation of the spiritual journey we all take through life. Unlike a maze, which is intended to confuse the participant with false paths and dead ends, the labyrinth has only a single path; one way leads you in and —reversed— the same path brings you out again. Having both left and right turns along the path creates balance. You may notice the path frequently draws you close to the center and then, just when you think you have arrived, it sends you back towards the periphery. This movement represents coming close to and moving away from your personal, transformative center—a place of intense knowing and change. Labyrinths have long been used as meditation and prayer tools. As you walk the path, bring your attention to the act of walking itself, allowing the deliberate act of walking to bring your breathing into alignment with your steps. Chat or other distractions may try to interfere with the walk. Acknowledge their existence without judgment and simply return your focus to the act of walking and breathing. The ‘Awapuhi Labyrinth was built in 1999 by Christie Wolf with help from her husband, John. This eleven-circuit pattern is a double-sized replica of the 13th century design inlaid into the floor of the Chartres Cathedral in France. The path that winds through ‘Awapuhi Labyrinth’s 90-foot diameter covers four-tenths of a mile one way. So, if you follow the path all the way in and all the way out again, then add the distance you have walked from the road and back, you find you have traveled approximately one mile. Some suggested symbolism found in the Chartres pattern includes the following. 113 “teeth” (here, concrete castings) form the halo around the outside of the Labyrinth. These are called lunations because they are believed to comprise a lunar calendar. The center area, or rosette, is a six-petaled rose said to represent the six kingdoms of existence: mineral, vegetable, animal, human, angelic, and divine. Look for six ceramic hearts in the six petals of the rosette that name these. These are the areas that separate the 180-degree turns in the path, the only part of the labyrinth where you don’t step. A labrys is a symmetric double-headed ritual axe and one of the holiest Cretan religious symbols. It is commonly associated with feminine qualities, causes, and divinities. Labyrinths in one form or another have existed in every civilization on every continent for nearly 4,000 years. Their origin is as mysterious as their uses are varied. One thing is universally agreed upon: They benefit the participant. Please take your time and enjoy the experience. In addition to the abundant flora and fauna, you notice the ‘Awapuhi Labyrinth —especially throughout the labryses— is populated with shells, tiles, figures, trinkets, chimes, and more that have all been lovingly gifted to the site by labyrinth walkers starting back in 1999. Each object was left by someone who found special meaning in the act of placing it. Many people return years later to delight in finding an old friend. Feel free to leave a gift of your own. And, when you return, be prepared to find it has disappeared in your absence. Gifting to the labyrinth is an exercise in pure giving, detachment, and a way to practice letting go of expectation. A group of us meet Tuesdays at 8am (more or less) to gently weed and maintain the grounds. Around 9am we wrap up and then walk the labyrinth in silence, followed by some convivial companionship in the gazebo. We welcome you. On second & fourth Tuesday mornings of the month, we gather in the labyrinth’s gazebo at 10am to color, draw, and enjoy each others’ company in a serene setting for a few hours. We can provide you with some coloring pages and art supplies or you can bring your own project. Won’t you join us next time? ‘Awapuhi Labyrinth celebrates the year’s Summer and Winter Solstices and Spring and Autumn Equinoxes by inviting our family, friends, and neighbors to a special evening torchlit walk. Don’t miss the next one. Get on the mailing list and we will remind you. The ‘Awapuhi Labyrinth is non-denominational. We welcome agnostics, atheists, Buddhists, Christians, Hindus, Muslims, Pagans, Wiccans, and all others. Please enjoy and respect this space and each other. ‘Awapuhi Labyrinth –on the Big Island of Hawai‘i– has no address. Find it here [Google map], at approximately 15-1601 4th Ave in Hawaiian Paradise Park between Kaloli and Paradise near pole #14. Open 24/7, come anytime. It may be tricky to find the first time, so persist! Email Deborah with any further questions. Get on the mailing list for upcoming events. 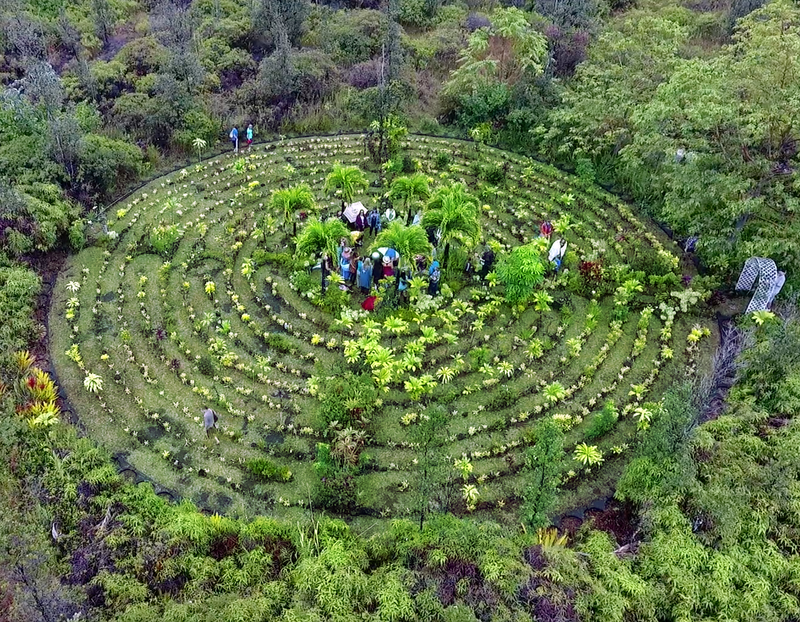 Find other Hawai‘i labyrinths on World-Wide Labyrinth Locator. See what others are doing on the The Labyrinth Society Global Group Facebook page.